This all-in-one, thermal duplex-printable DuplexPackSlip is designed for customers who typically ship many orders with single cartons and companies that receive and reship merchandise in the same sealed container. 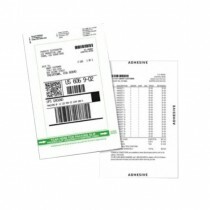 This label features a shipping label combined with a packing slip / return label or marketing piece such as promotion codes. These labels could be both hand applied or machine applied. Some of the many benefits of this label is that the shipping labels and packing list will be 100% matched. With just one pass through a duplex printer, the shipping label will be printed on the label face while the liner becomes the packing list. So, don’t wait just go ahead and order these labels for a huge savings across the board by eliminating the plastic “ Packaging List Enclosed” pouch and by reducing labor.